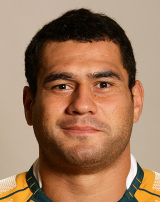 The industrious George Smith was 'Mr Consistent' for Australia from his debut against France in 2000 to his last appearance in the green and gold against Wales in 2009. In the process he became the Wallabies' most capped forward, eclipsing the mark of the legendary John Eales. One of an elite group of players to have made his professional and international debuts in the same year, his work rate and skills in the loose in particular saw him cement a reputation as one of the sport's leading players. He was signed to the ACT Brumbies by Eddie Jones and made his Super Rugby bow in 2000, just two weeks into the campaign against the Sharks at Canberra Stadium. Later that season he would score a try in his side's narrow Super 12 Final loss to the Crusaders. In a remarkable year, Smith was also capped for the first time on the Wallabies end of year tour against France at the Stade de France in Paris. Smith and the Brumbies clinched their first Super 12 crown the following year with a comprehensive victory over the Sharks. Further praise came later that year when he celebrated his 21st birthday with a man-of-the-match performance against the British & Irish Lions in the third and deciding Test in Sydney. In 2002, his Brumbies side were edged out in the Super 12 Final but his excellent form saw him named as the first recipient of the John Eales Medal, awarded by the Australian Rugby Union and the Rugby Union Players' Association to their Player of the Year. He had been favoured at No.8 for the early part of his international career before switching to blindside-flanker in 2003. As part of the Wallabies' 2003 Rugby World Cup squad he started all seven games, culminating with the final defeat to England. More domestic success followed in 2004 with the Brumbies edging out arch-rivals the Crusaders in the Super 12 Final. Over the next couple of years he was utilised at No.8, blindside and eventually openside - often battling with rival Phil Waugh for the chance to nail down the No.7 shirt. In 2005, he played his 50th Test against France at the Suncorp Stadium in Brisbane and was also selected in the starting line-up for the Australia Rugby Union's Wallabies' Team of the Decade. The following year he played in 12 of the 13 Wallaby Tests and was named vice captain for the first time against Italy in Rome. Smith was again among the Super 14's best in 2007 and became the seventh player to captain the Brumbies when he led the side for six matches in Stirling Mortlock's absence. Later the same year Smith took part in his second Rugby World Cup and featured in four of the Wallabies' five matches in France - including becoming the 75th Australian Test captain when he led the side against Canada. A disappointing Super 14 season followed for the Brumbies in 2008 but Smith retained his spot in the Wallabies' side with the arrival of new coach Robbie Deans. And he cemented his place in the record books by surpassing Eales' mark for an Australia forward against South Africa in the opening match of the Tri-Nations in Perth. Smith ended speculation regarding his playing future by agreeing a new two-year deal with the ARU in May 2009 but announced in early 2010 he was retiring from international rugby with immediate effect in order to spend more time with his young family - 10 years after making his debut against France. He also announced that the 2010 Super 14 campaign would be his last and that he would later move to French side Toulon before switching to the Suntory Sungoliath in Japan. He made a surprise return to the Super Rugby stage with the Brumbies in 2013 having been temporarily released by Suntory and his form saw him return to the Wallabies line-up for the visit of the British & Irish Lions.